TALK SHOP: Opposition Leader Kamla Persad-Bissessar speaks with MPs Dr Bhoendradatt Tewarie, Dr Roodal Moonilal and David Lee after a press conference at the Passage to Asia restaurant in Chaguanas yesterday. THE Opposition Leader yesterday accused the Prime Minister of committing “industrial genocide” when he announced the closure of Petrotrin’s Pointe-a-Pierre refinery and the restructuring of the State oil company. 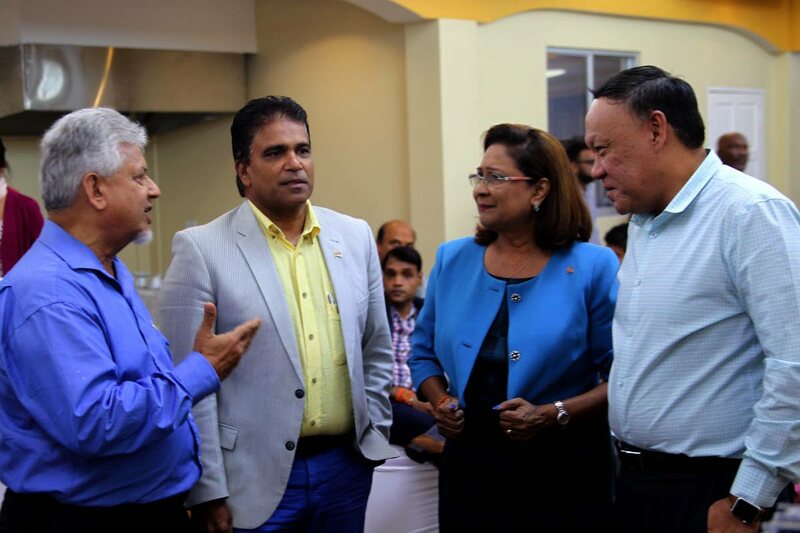 Kamla Persad-Bissessar made her accusation at a news conference at the Passage to Asia restaurant in Chaguanas, where the UNC held a strategic planning retreat. She said the UNC would consider whether or not it will join the labour movement in its day of rest and reflection on Friday. She also said the UNC will file a motion of no-confidence in government’s handling of Petrotrin in the Parliament. While Oilfield Workers Trade Union (OWTU) president-general Ancel Roget has called for a public debate about Petrotrin, Persad-Bissessar said it is “never too late to debate” the matter in Parliament. Insisting that neither her former administration or any administration she “will lead” in the future would never have closed the refinery, Persad-Bissessar said only the People’s National Movement (PNM) was to blame for the state of affairs at Petrotrin. Persad-Bissessar disputed the figures Dr Rowley referred to in his address to the nation on Sunday. She maintained that Petrotrin paid $20 billion in taxes to the State under her government and that the PNM dispensed with a US$500 million unsecured loan which her government had obtained to help Petrotrin. She maintained that the refinery could still be used to process oil from Guyana. Persad-Bissessar did not know whether there was a connection between the conclusion of the Dragon gas deal with Venezuela and the closure of the refinery. She scoffed at Rowley’s statement that Government would look after Petrotrin’s workers and fence line communities. Reply to "Kamla: Industrial genocide by PM"